Famous Dave’s Cole Slaw – this is the perfect addition for a barbecue. Thanks to Chef Boy RV for sharing this recipe. Enjoy making Famous Dave's cole slaw at home. Toss the cabbage and carrots thoroughly. Mix the Miracle Whip, horseradish, dry mustard, white pepper, salt, garlic powder & celery seed in a large bowl. Add the cabbage mixture and blend well.Refrigerate for at least 4 hours to allow the flavors to meld. Serve with your favorite barbecued meats. There may have used to have been pineapple in it. But, I can tell you that is not the case anymore. I just finished eating some and there was no pineapple or red cabbage in it. Now I do know why there is a bite to it though. Has to be the horseradish. 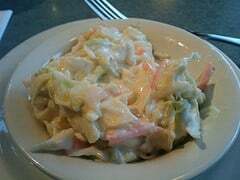 I love Famous Dave’s Cole Slaw. This recipe is way too hot for Daves dressing! Maybe it should be prepared horseradish, and NOT raw grated horseradish. I don’t know if there are different heats of horseradish, but ours was so hot it made it unpleasant to eat. Anonymous is right—I worked there, too, and there is pineapple in the cole slaw. Sorry, but the recipe above is not the right one if you are looking for Famous Dave’s!